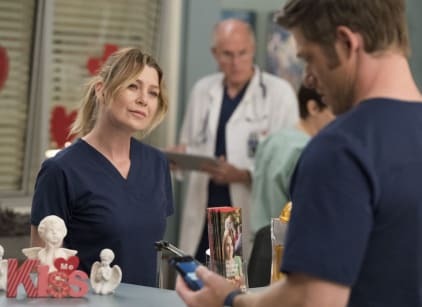 Deluca continues to pursue Meredith. She agrees to go out with him on New Year's Eve at Alex and Jo's party. She stands him up to he with a patient . He is angry and gives her the cold shoulder. He calls her out for playing games and being afraid to love. To prove him wrong she asks Link out on a date. After a rough case where they lost their patient, DeLuca whisks her off to the rooftop for an impromptu date. They kiss and she stands up Link on Valentine's day. Levi and Nico get closer and are super happy. Bailey tries to apologize to Ben and get him to come home. She finally tells him that she was dealing with her anxiety and that it wasn't his fault. He comes back and builds her her treehouse. Amelia and Owen visit Betty in rehab. She tells them that her name is really Britneyy and she ran away from home. Her parents don't know where she is or about Leo. Owen is upset that he may lose Leo and wants to look for her parents. He lashes out at Amelia and they make up. Owen and Teddy are having a girl. Teddy gets close to Tom and they are casually dating. Catherine's recovery process is grueling and she refuses help. Jackson is hurting for his mother and Maggie talks to him and comforts him. Catherine starts feeling better. Meredith patient Natasha was in a coma for months. She wakes up but she isn't getting better. Her fiance is super supportive and devoted to her. She eventually decides to die. He's devastated. The doctors give them their perfect wedding ceremony and she dies afterward.